Along with the Super Cub, Cessna 180s and 185s are considered to be prime bush planes. While the Cessnas will not offer the same short field abilities of the Super Cub, they will easily carry four adults. Some models are fitted with six seats but the last two seats are very small and cramped. 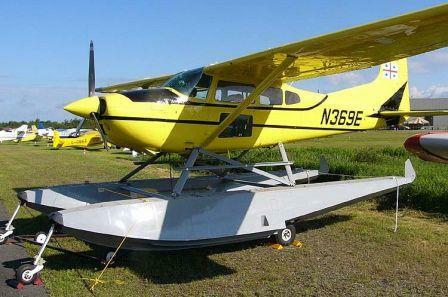 Like the Super Cub, Cessna 180s and 185s are easily fitted with floats, skis or tundra tires. Cessna ceased producing the 180 in 1981 and the 185 in 1985. A kit version of these planes has been offered as the “Cyclone” from a Canadian manufacturer, however the current availability of the Cyclone kit is unknown. Reportedly, 25 Cyclones have been manufactured. The Cyclone has a longer wing and accepts more powerful engines that the stock Cessnas. The Cyclone kit is offered by St-Just Aviation. The 180 and 185 are very similar in appearance, but the 185 has a larger dorsal fin attached to its vertical surface (although some 180s were produced with the larger fins and others have been modified to its specifications). Both aircraft are constructed of 2024-T3 Alcad aluminum using a semi-monocoque design with rivet fasteners. While the design was produced easily on an assembly line, the exact construction of the 180 and 185 would likely make kit-construction of such a plane to be challenging at the very least. Because of their outstanding bush flying abilities, Cessna 180s and 185s command premium prices on the used market. While extremely well worn examples may fetch prices of $50,000 or less, these airplanes typically sell in the $50,000 to $150,000 price range, depending upon condition and avionics. Extremely well refurbished examples regularly sell at prices exceeding $150,000. Because of these prices, wrecked and project planes are quickly snapped up by price-weary Cessna aficionados. Cessna aircraft parts are still widely available for the 180/185 series airplanes. Except for the conventional landing gear, the 180 and 185 fly a good deal like the ubiquitous Cessna 182 of which most pilots are familiar. Both airplanes feature stable, vice-free, flying characteristics. Cessna began production of the 180 in 1953 as a more powerful and stout version of its 170 model. Both aircraft featured conventional landing gear and both were eventually fitted with tri-cycle landing gear (becoming the 172 and 182 respectively). 180s were factory-equipped with Continental 0-470 engines intially of 225 hp. Modifications allow installation of 300 hp engines. This next video is a bit esoteric but some great eye candy. The Cessna 180 pilot has to follow some pretty sharp curves in the river to get enough speed for take off. Laurie Nadeau, a Canadian commercial pilot for 40 years, owns a 1965 Cessna 180 on wheels and thinks of it as an awesome aircraft. She wrote in to say that her dream plane is either the Mooney Ovation or the Cessna 182 Boss on amphibs and hydro skis. But, when it comes down to choosing the best bush plane, Laurie said, "Depends on the role it has to play & if money is not a problem. Twin Otter, Turbine Beaver or Otter. Best budget, J3, Best performance Super Cub, Husky, Maule, All good budget & preference. The German "Stork" Would probably outperform all! (There is Also the Polish Wilga)". We understand it's a tough decision with a lot of personal factors involved! Cessna introduced the 185 in 1961 as a more powerful version of the 180. Initally the 185 featured a 260 hp IO-470 Continental engine and in 1966 the engine was changed to a Continental IO-520 producing 285 hp. Modifications allow installation of engines up to 350 hp and, very rarely, a 185 will be seen with a small turbo-prop engine. Both aircraft would cruise at speeds approaching 150 mph and had stalling speeds below 61 mph (slower with modifications). Several companies offered STOL (Short Take-Off and Landing) modifications for the Cessnas and these modifications ranged from simple drooped leading edge cuffs to dropped leading edge cuffs and drooping ailerons. The planes carried a full compliment of instruments and avionics and many non-bush pilots favored them for instrument flying as both were very stable airplanes in flight. While neither Cessna offered the short field capabilities of the Super Cub, both were quite respectable in their ability to operate from short strips. On balance, the Cessnas offer a good compromise between load- carrying abilities and short-field performance. The Cessnas do not offer the same short field performance of Super Cub (and similar aircraft) but they will easily carry four adults. Helio Couriers offer Super Cub-like performance for four adults, but the Couriers are rare, have engines that are expensive to maintain and can be challenging to maintain in general. Thousands of Cessna 180s and 185s were produced and parts availability does not appear to be a matter of great concern for the foreseeable future. Murray from Alberta, Canada wrote in to brag about the Cessna 185, "Wheels, skis, floats it would do all that you asked of it. Fill it with frieight until it couldn't hold any more ( or the spreader bars were touching the water) and given enough room would get you airborne. Flew beautifully and easily handle 6 adults on only 300hp. Considered the half ton of light haul charter ops. AND the heater always worked!!"